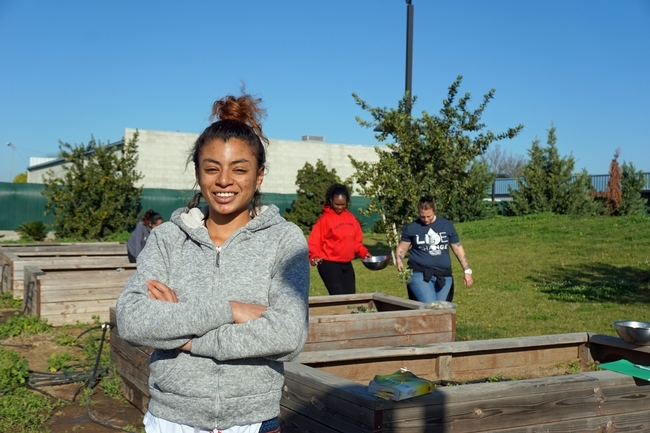 Nutrition education has stretched into a garden at a Fresno facility where women are putting their lives back together. The UC Cooperative Extension UC CalFresh nutrition education program in Fresno offers its five-week series “Plan, Shop, Save and Cook" at Rescue the Children, a residential program where women who were abused, homeless, previously incarcerated or faced other challenging life circumstances stay for 18 months to learn life and job skills, plus nurture their spirituality. 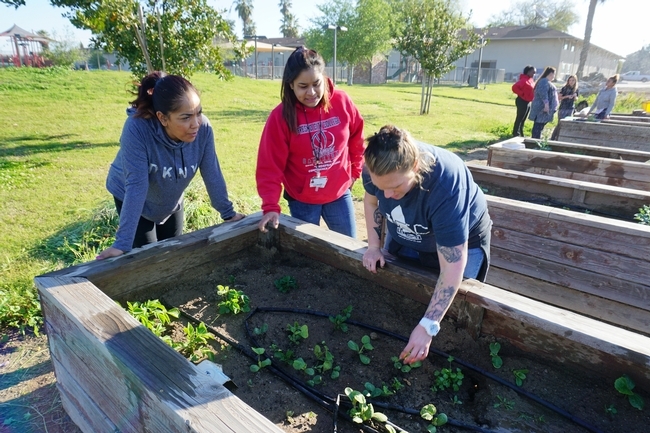 UC CalFresh nutrition educator Kristi Sharp, center, works with Rescue the Children residents in the garden. Rescue the Children is a program offered by the Fresno Rescue Mission. Women with young children or without are referred by such agencies as child protective services, the county probation office and courts. The women make a personal commitment to stay for a year and a half. Rescue the Children is a safe place for women to get away from destructive lifestyles, where they can heal, learn, grow and become productive members of society. Rescue the Children resident Cecelia beams proudly at the garden. UC CalFresh reaches out to a variety of community programs and schools with nutrition, garden and physical activity education to teach recipients of CalFresh (formerly called food stamps) and those who are eligible for CalFresh how to make safe, healthful and budget-friendly dietary and cooking decisions. 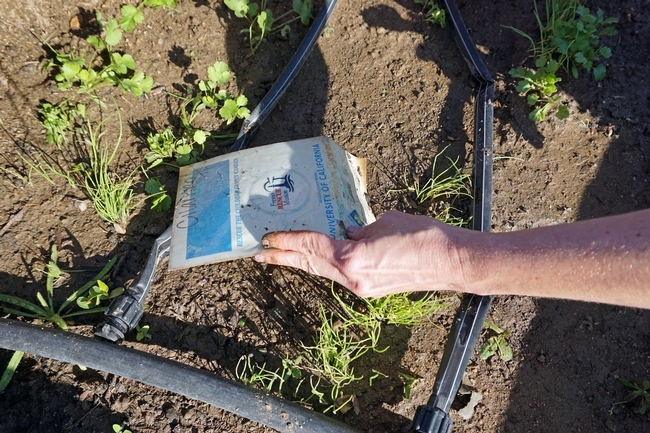 CalFresh benefits – which are part of USDA's Supplemental Nutrition Assistance Program – can be used to buy food, edible garden transplants and vegetable seeds. 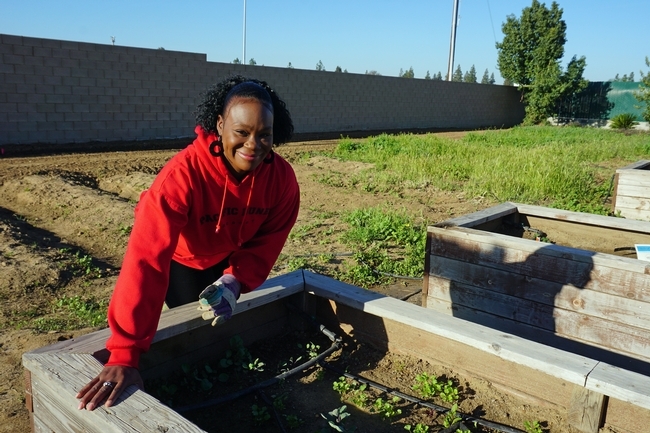 During a nutrition education session last year, one Rescue the Children resident asked whether an unplanted garden area in the facility could be restored to grow vegetables, said Nancy Zumkeller, UC CalFresh nutrition educator. 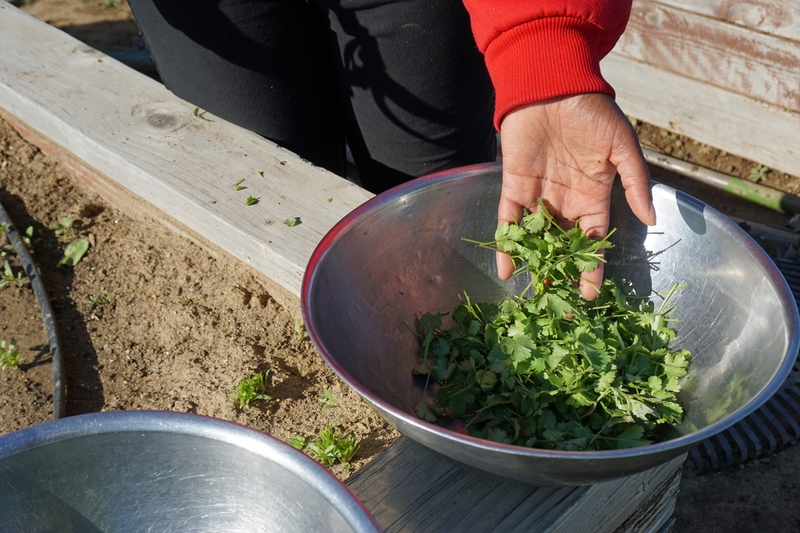 As a UC Cooperative Extension program, it was easy to connect with the UC Master Gardeners and collaborate to provide garden and nutrition education. Several Master Gardener volunteers and the UC CalFresh garden team provided classroom gardening training and worked with the women to clear weeds, update irrigation, and sow seeds and transplants in four raised-bed plots. 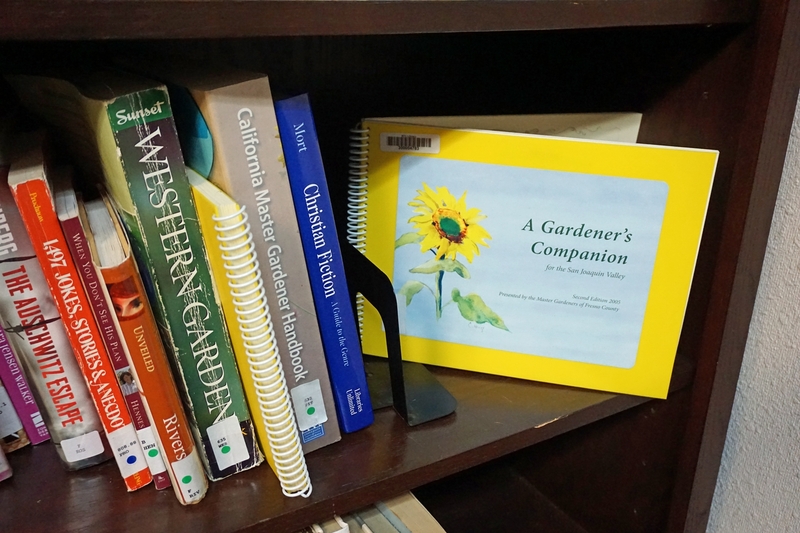 The Master Gardeners donated gardening books to the Rescue the Children library, including the Master Gardener Handbook, a definitive guide to environmentally sound gardening practices with chapters on soil, fertilizer and water management, home vegetable gardening, and detailed information on number of specific garden crops. As part of their structured schedule of classes, work, meals and Bible study, the women spend one hour each Wednesday working in the garden, a time that residents have come to relish. Debriana in the Rescue the Children garden. Adriana said she values her new gardening knowledge. Resident Darcy has lived at the facility for nine months, and been involved with the garden for six months' time. Left to right, Cynthia, Jasmine, and Darcy work in the garden. UC CalFresh provided plant markers for the garden. Cilantro harvested in the garden is destined for the women's lunchtime salad bar. The Rescue the Children library contains gardening books donated by the UC Master Gardener program. 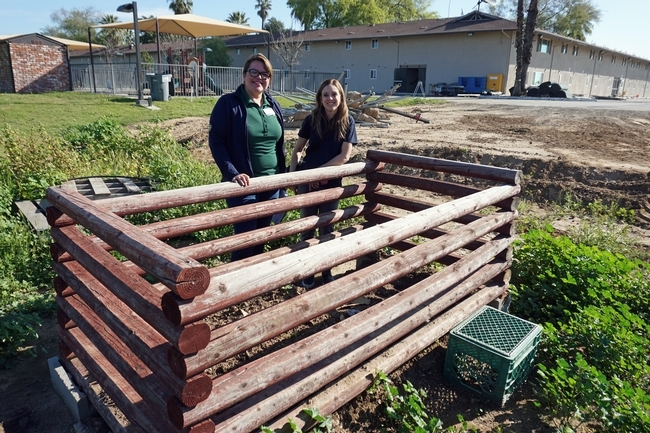 UC CalFresh nutrition educators Nancy Zumkeller, left, and Kristi Sharp stand at the compost bin at Rescue the Children. 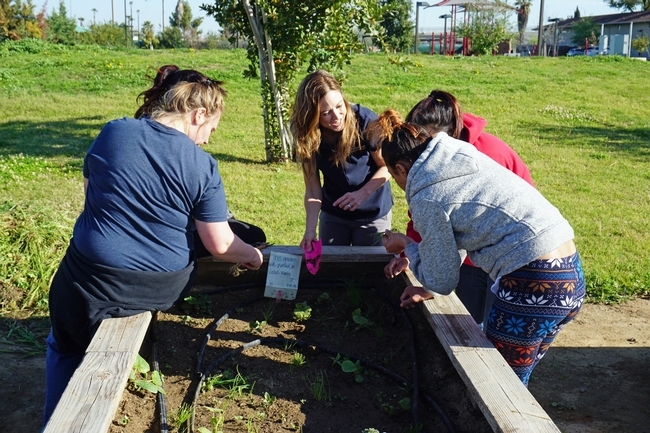 The residents are learning to compost food scraps, garden trimmings, hair from their brushes, lint from dryers and paper. *The residents' last names were omitted for privacy.